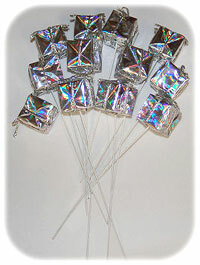 Mini Holographic Gift Packages on Wire Stems. 12 stems for $4. 1" x 1" x 1" on an 8" wire. Beautiful added to your gift baskets as an added accessory.